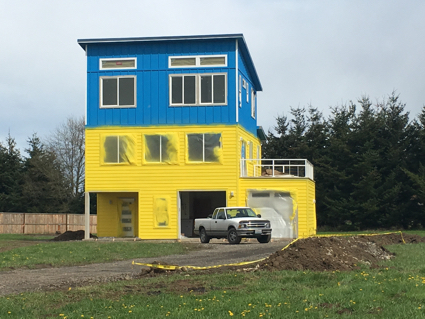 Perhaps we should have a contest called the ugliest house in Sequim. That might create a fun photo album. I’ve seen some homes that could compete for the ugliest house in Sequim, but you could add Port Townsend and Port Angeles as strong competitors. This 3-story home is the brightest yellow and a bright blue two tone wonder. As a real estate professional, I’ll tell you what came to my mind when I first saw this home. First, I wondered who in the world would paint a house such gaudy colors, and second a 3-story home will be almost impossible to sell since retirees want single level homes. Now every time I drive past this home, I try to look the other way, but a bright video plays itself out in my mind and I see it anyway. There’s a purple house in the Sequim area, and I like to tell my buyers when we’re driving past that house that every town has a purple house, and we all laugh. 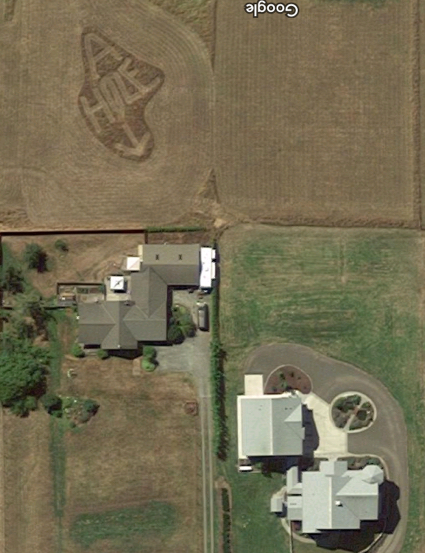 I also have said, “Imagine being a neighbor and see that purple house every day!” But I just learned that one of the neighbor’s mowed his field with the words “A Hole” and an arrow pointing toward the purple house. Here is a photo from Google maps. While this isn’t funny for the players involved, you have to find some humor in all of this. Do you have any crazy photos of the ugliest house in your area? If you do, send me a photo of your ugliest house. 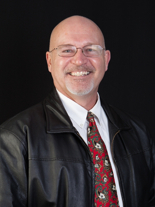 Are Homes Selling in Sequim and Port Angeles? Sequim and Port Angeles home sales have slowed down–no doubt about it. We see how much of the real estate market has crashed in other parts of the country, but Sequim and Port Angeles have some good news. It’s not all so terrible here. Take a look at home sales in the month of September for the past four years. 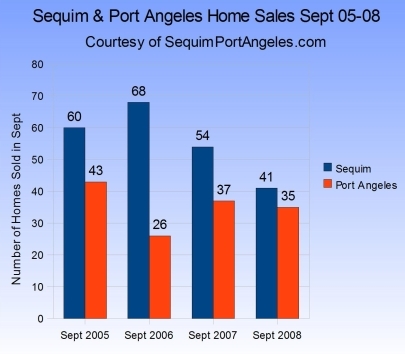 This past month, September of 2008, 41 homes sold in Sequim and 35 homes sold in Port Angeles. Not bad considering. 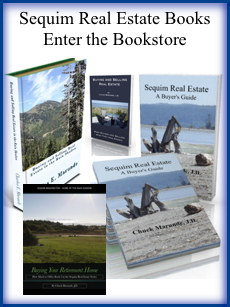 Are homes selling in Sequim and Port Angeles? In the first four months of this year sales are down. We all know that. I was going to write, “That’s not front page news,” but it still is. The market has taken a beating around the country, especially because of the mortgage fiasco. When sales slow down in California, Arizona, Texas, and around Seattle, our buyers have to postpone their plans to purchase their retirement homes here. But exactly how much is Sequim and Port Angeles down in home sales? Here I compare the first quarter of each year since 2000. This chart shows that home sales for Sequim and Port Angeles combined for January through April of 2008 are at pre-2003 levels. But let’s face it–the real estate market really took off in 2003 through 2005 with great residual through 2007. The market is down. No doubt. 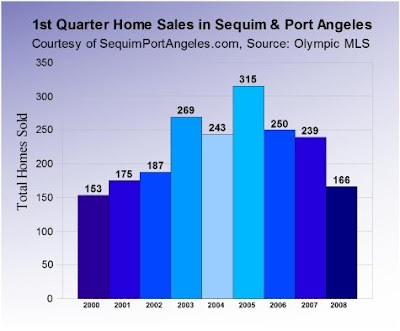 But consider this: in the first four months of this year 166 houses sold in Sequim and Port Angeles. Buyers are still arriving. That is good. Those who are at the retirement point and have planned to move here, are still coming, unless their real estate market is so slow they can’t sell their homes. The economy and the real estate market in the U.S. is amazingly resilient. 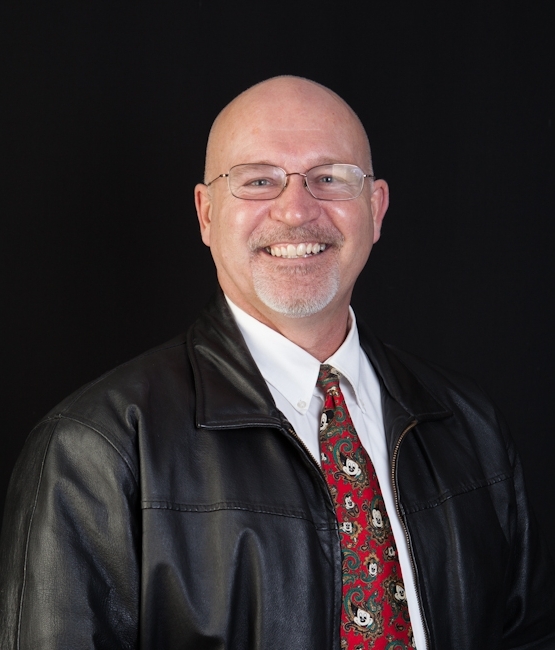 I predict a reasonably good real estate market through the spring and summer in Sequim and Port Angeles. It is an excellent time to buy, and if you’re selling, a good home in a good area has not lost value in these past months. The threshold of value remains strong.